With BJP trouncing the opposition in Uttar Pradesh, the markets opened with a gap on the opening bell. A gap is simply an open either higher than a previous day’s high or lower than a previous day’s low. But do gaps have any predictive value? If a stock opens above or below the previous bar’s closing price, we have a Gap. This gap could remain for the duration of the bar or get closed. But because the ticker opened at a certain level, regardless of future movements, the ticker is said to have opened with a gap. Common Gap: Markets generally don’t open at the same price as it closed the previous day. But small gaps of such nature have no predictive value and being random, its best ignored. On the Nifty 50, 95% of positive gaps are 0.004% or lower. That being a very insignificant number is rightly overlooked in terms of having any predictive value. They are, in effect, useless. 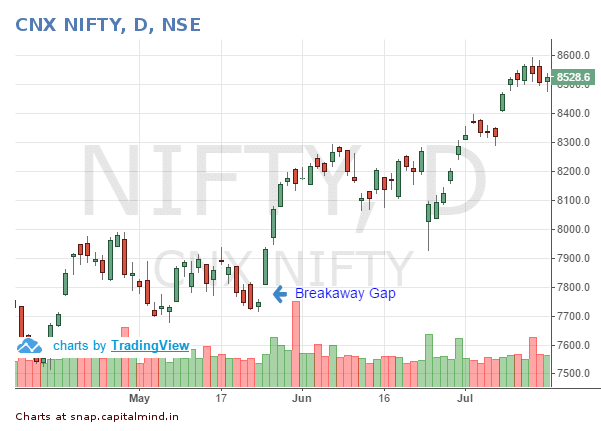 Breakaway Gap: Contrary to a Common Gap, a breakaway gap is when markets gaps up and then runs away without giving any opportunity to close that gap. A perfect example of such a setup on the Nifty 50 would be the gap one saw when markets opened on 25th May 2016. Markets gapped up more than 0.80% and more or less established a new trend which took it 16% higher before it ultimately made the top. Runaway Gap: Breakaway gaps and Runaway gaps are similar with the difference being in the price action prior to the gap opening. While breakaway gaps can happen anywhere, Runaway Gaps happen at inflexion points / breakout – breakdown points, mostly after a period of consolidation. If Nifty continues to move higher from the current levels, the gap that got formed today can be said to be a Runaway Gap since this has come after a period of consolidation as well as being a gap which broke away from the said range. Exhaustion Gap: Now, if instead of rallying further, markets were to take a break and start retracting, today’s gap rather than being showcased as a example of Runaway gap would be showcased as a example of Exhaustion Gap. Exhaustion gap happens when markets been rallying for sometime with the final hurrah being when market gaps up but then declines either during the day or in the next few days. Here is a chart of the average gap (Absolute) between the previous day’s close and the next day’s open. Notice something interesting? 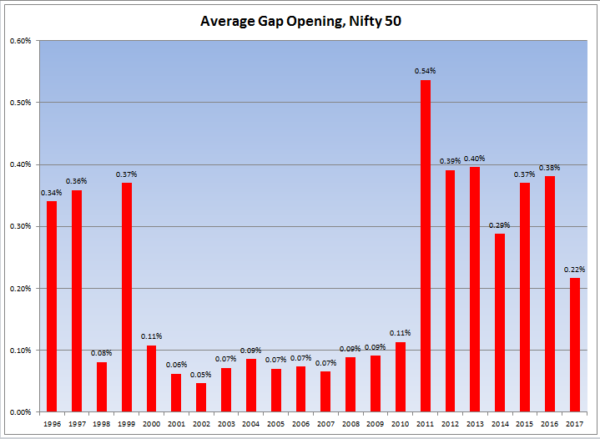 Gaps were big until 1999 before it slumbered for the next few years before once again seeing a higher gap from 2011 onward. What is happening? A bit of history will be essential in understanding the reason as to why gaps were seen prior to 2000 but then suffered a gap of nearly 10 years before appearing in force once again. Prior to 2000, NSE was not the dominant stock exchange as it competed with multiple regional stock exchanges (Bombay Stock Exchange included) for a piece of the pie. During those times, NSE opened at 9:55. Now, why 9:55? Well, during those days Bombay Stock Exchange used to open at 10:00 and when NSE launched, they must have figured that the best way to get a good book by the time Bombay Stock Exchange opened was to open a bit prior to them. Smaller regional exchanges went a step further and started to open as early as 9:00. This was done essentially to give members enough time to rollover their badla positions which used to be huge without much movement in price since prices used to move and were dictated by exchanges such as BSE and later NSE. Since quite a few exchanges such as Delhi and Calcutta used to transact heavily well before the opening of NSE, NSE open prices got dictated by prices elsewhere and hence the gap in opening. The Infotech Crash of 2000 more or less triggered the demise of nearly all regional stock exchanges with most of the volumes being transacted moving to NSE or BSE. This also meant that the pressure on prices at the open was much lower making it possible for normal market opens. Secondly, since Nifty 50 in itself cannot be traded, the first trade of any stock regardless of its weight shall set the opening mark in Nifty and given that it was rare to see all 50 in action at the same time, even on days when bullishness was overwhelming, markets opened close to their previous closing price only to move up immediately after. In fact, even on the day when markets shot up 20% before the screens even lit up on 18the March 2009, Nifty 50 official opening price was at nearly the same price as it had closed on the day before. So, what changed in 2011? The change that can be seen in the chart since 2011 came about thanks to the introduction of Pre-Open by both exchanges in the later part of 2010. With Pre-Open, markets now had a buyer / seller and a trade right at the opening bell which in-turn meant that markets now opened inline with expectations. How has Nifty 50 performed in the days following a positive gap opening? t in the above data denotes to the performance from date of the Gap (t) which is cumulative. What it shows is that Gaps are generally mean reverting with one seeing a small retracement most of the time. 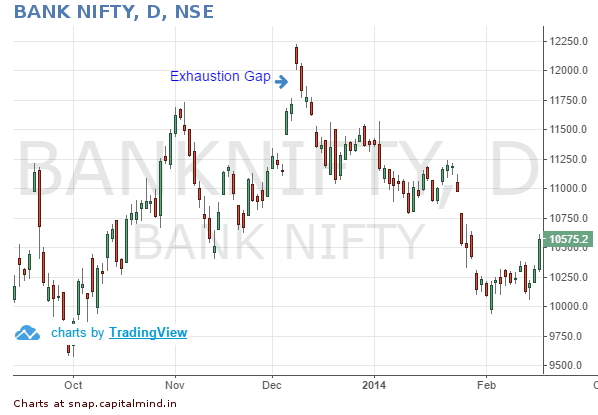 Now, lets look at the inverse of the same – what about Gap Downs? Here, we see way more Greens than Reds despite the fact that the momentum itself is negative (Gap down’s happen when there are more sellers than buyers right at the start), which once again is mean reverting. The key reason is that Gaps denote excesses with most of the time investors trying to get in or get out any available price. Excesses rarely sustain unless such a excess comes at the bottom in case of a gap up or a top in case of a gap down. Unlike in stocks where sentiments can change rapidly, sentiments in Indices rarely change as much based on a single news point. Stocks that breakout on gaps rarely fall back while the same couldn’t be said about Index. While Nifty is seeing strong positive momentum, historical evidence is geared more towards a short term reversal versus a runaway rally. On the other hand, this breakout has come after nearly 2 years. Nothing can be more bullish than that, and we’ve closed at an all time high. Will this be a runaway/breakaway gap, or will this fizzle out as an exhaustion gap? Time will tell.